Boat Roller Ramp | Customer PWC & Boat Ramp Photos | VE-VE Inc.
DDA-1017; 17 foot long, 1000# capacity, ALUMINUM BOAT RAMP with 3 Ea. BR-20; Support Kits that are elevating the ramp at an incline. NOTE: TO READ CUSTOMERS PRODUCT SATISFACTION TESTIMONIAL, CLICK ON "DETAILS" OR PICTURE, ALSO FOR A LARGER VIEW AND MORE DETAILS. Price shown is for DDA-1017 ONLY! 2 ea.) DDA-2017; 17 foot long, 2000# capacity, ALUMINUM BOAT RAMPS, with twin boats on them. Price shown is for 1ea. DDA-2017 ONLY! DDA-1000: 24 foot long, 1000# capacity, Aluminum Boat Ramp, with BRA-10 (8' Extra Section) & BRA-44 (Section Disconnect / Elbow Kit). Price shown is for DDA-1000 ONLY! 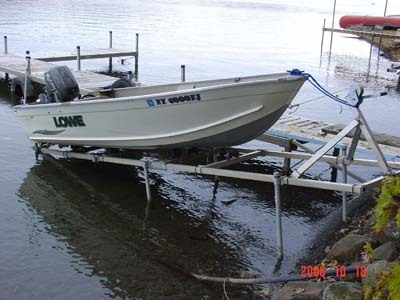 DDA-2000; 24 foot long, 2000# capacity, Aluminum Boat Ramp, with BRA-15 (8' Extra Secton). Also a BRA-60 (Keel Cross Tube) & BR-80 (Roller Tube Support Kit) that allows ramp to be be split at joint and door to be closed. Price shown is for DDA-2000 ONLY! DDA-2000; 24 foot long, 2000# capacity, ALUMINUM BOAT RAMP, shown with optional BRA-15-4 ( 4' Extra Section ) & BRA-54 ( Disconnect Kit ). DDA-2000; 24 foot long, 2000# capacity, ALUMINUM BOAT RAMP, with optional Bow Stop, 7-1/2 Ft. Bunk Guide-Ons & Installation Wheel Kit ( Note: wheels should be taken off if boat is over 1,500 lbs. ). DDA-3000; 24 foot long, 2600# capacity ALUMINUM BOAT RAMP, with options BR-358; Electric Winch, BR-27; Winch Mt. Plate, BRA-300; 8' Extra Section & BRA-74; Sec. Disconnect Kit. Price shown is for DDA-3000 ONLY! DDA-2000; 24 foot long, 2000# capacity, ALUMINUM BOAT RAMP. 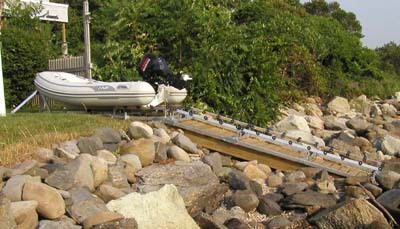 DDA-2000; 24 foot long, 2000# capacity ALUMINUM BOAT RAMP, with options BR-358; Electric Winch, BR-27; Winch Mt. Plate, 2 pr. T-930; Adj. Roller Guide-Ons & added T-905; 5' Roller Bunks. NOTE: This Boat Ramp was specially made wider and the keel rollers not added to better suit this inflatable boat. The T-905; 5' Roller Bunks were also added on the winch section for support. NOTE: The winch on this boat ramp is mounted upside down! DDA-2000; 24 foot long, 2000# capacity, Aluminum Boat Ramp with IWP-58 (Installation Wheel Kit). NOTE: Wheel kit is only rated for 1500# capacity so wheels are normally taken off after Ramp installation. Also, water level is down in this picture & end of Ramp should be under water! DDA-1000; 24 foot long, 2000# capacity, Aluminum Boat Ramp with BRA-10-4 (4' Extra Section), BRA-10 (8' Extra Sectoin) & BRA-44 (Section Disconnect / Elbow Kit). 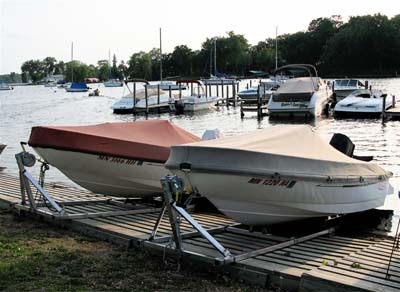 DDA-1000; 24 foot long, 1000# capacity, Aluminum Boat Ramp with BR-28 (Guide On's Mount Tube) & T-945-G (45" Post Guide On's).NOTE: This Boat Ramp was equipped with adjustable keel roller panel brackets to allow keel rollers to be adjusted up, even with top of wobble rollers, for a flat bottom boat.